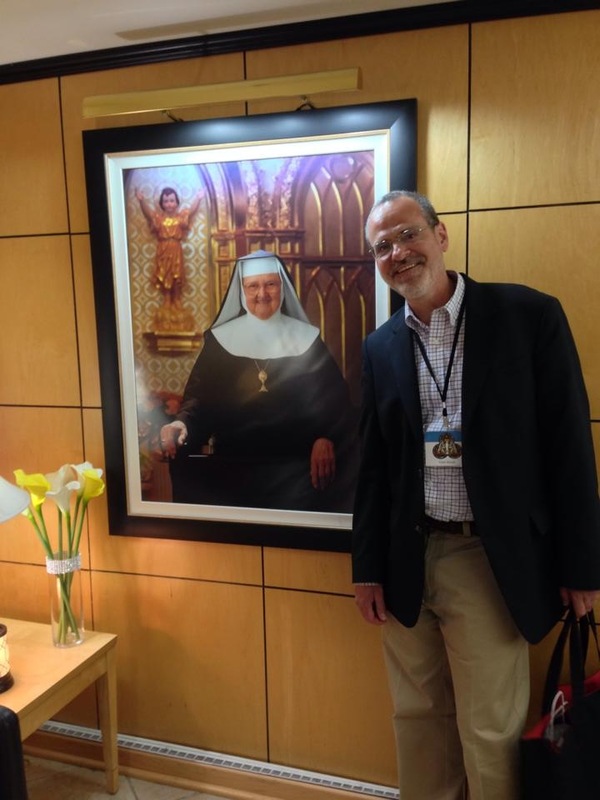 A New Catholic Morning Radio Show For Philadelphia! Your Mornings Are About To Get A Little Brighter! I am very excited! As you probably know, I was born and raised in Philadelphia and have been eating soft pretzels, Tastykakes and cheesesteaks for as long as I can remember. I have experienced many ups and downs with the Phillies, Eagles, Flyers and Sixers. I know and love the City of Brotherly Love! 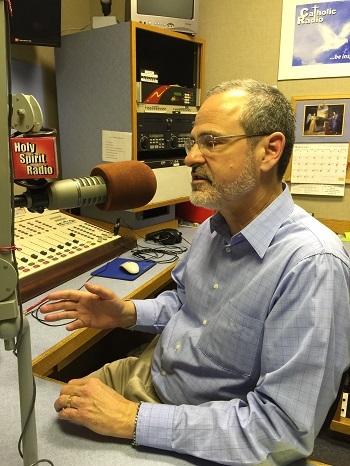 Despite being ranked as the ninth largest radio market (according to the July 2016 Neilsen Audio Ratings), Philadelphia has never had a local Catholic morning radio show. 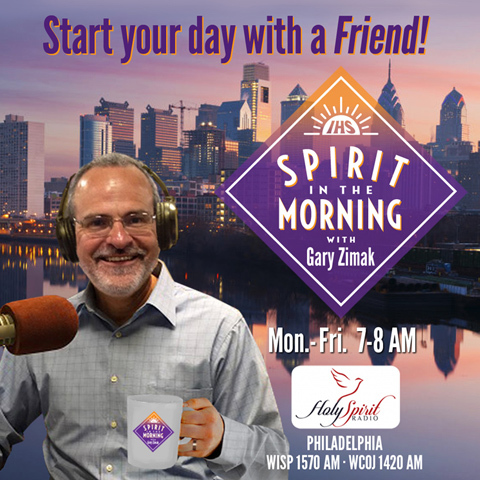 That will change on October 10, 2016 when Spirit In The Morning comes to Holy Spirit Radio in Philadelphia! Every Monday thru Friday at 7 AM Eastern, I’ll help you to start your day with a mix of music, Scripture and inspiration. And you better believe that I’ll offer hope to my fellow “worriers”! This is a show that I have wanted to do for a long time and soon it will become a reality. If you’re outside of the Philadelphia area, the show will stream live on Holy Spirit Radio and TuneIn Radio. Finally, if you’re wondering about how this will affect my work as a full time Catholic evangelist, the answer is that nothing will change. 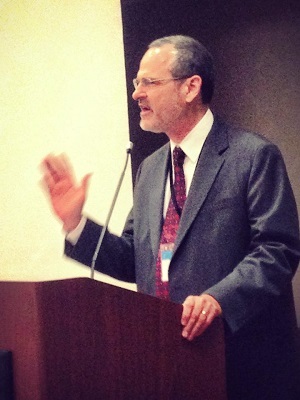 I will still be traveling around the country giving talks and leading parish missions. 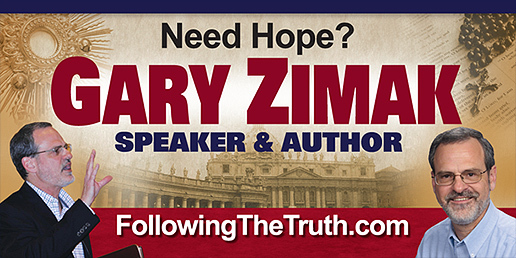 I will still host The Gary Zimak Show on BlogTalkRadio and continue to do my various Catholic TV and Radio interviews. And my next book, Stop Worrying And Start Living! will be released in the Fall. Spirit In The Morning is just another way for me to spread the Good News. Please keep me in your prayers as I get ready to begin this new project. I have a feeling that the Holy Spirit is up to something exciting! Start your day with a FRIEND! 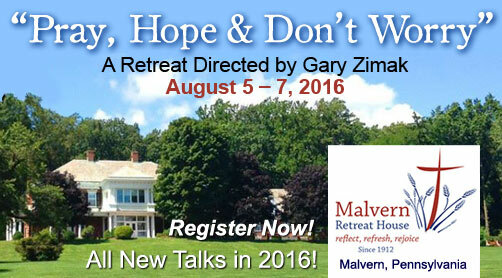 A Catholic Retreat For Those Who Worry! 1:30 Conference #3 What If Mary Said, “No”? 7:30	Conference #4 You Can’t Walk On Water If You’re Sitting In The Boat! 8:30	Conference #5 What Does God Want Me To Do? 1. Getting Personal With Jesus – Many people go through life knowing about Jesus, but never get to know him personally. Sadly, many Catholics don’t even know that it’s possible to have a close, personal relationship with Christ. Using some of the techniques featured in his soon to be released book on the topic, Gary will give you practical suggestions for becoming close friends with the Lord. In addition, you’ll discover why it’s critical that you share Jesus with others and learn simple ways to do so. 2. From Fear To Faith – Are you tired of worrying? After struggling to overcome anxiety for many years, Gary Zimak has learned that Jesus Christ can help us to win this battle. In this talk, based on his best-selling books A Worrier’s Guide To The Bible and From Fear To Faith, Gary will share his step by step approach for breaking free from worry by encountering Christ in His Church. 3. What If Mary Said “No”? – We often assume that Mary had to say “yes” when asked to become the Mother of the Savior. In reality, the Blessed Mother’s assent was a conscious choice on her part. 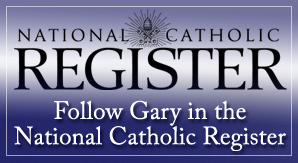 In this talk, based on Gary’s book, Listen To Your Blessed Mother, we’ll look closely at Mary’s life and learn how to imitate her constant “yes” to the Lord. You’ll also discover how Mary can lead you closer to Jesus than you ever thought possible. 4. You Can’t Walk On Water If You’re Sitting In The Boat! – Did you ever feel like God is asking you to do something, but you’re afraid? That’s perfectly normal. Whenever the Lord asks us to do anything, there is always some element of fear involved. There’s no reason to let fear stop you from letting God work great miracles in your life, however. In this talk, Gary will give you practical advice for conquering even your greatest fears and teach you how to surrender control of your life to the Lord! 5. What Does God Want Me To Do? 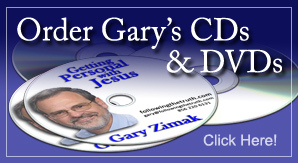 – As someone who went from a secure career as a project analyst to an uncertain future as a Catholic lay evangelist, Gary knows what it takes to discern God’s will. How do I know what the Lord is calling me to do? How can I learn to hear Him speak in a noisy world? How can I learn to trust in His providence? All these questions (and more) will be answered in this talk, based on Gary’s own personal journey and detailed in his book Faith, Hope, And Clarity: How To Know God’s Will. You’ll learn that it is possible to hear God speak and experience peace in the midst of uncertainty. This peace can be experienced only by surrendering to the Lord’s will. This retreat is open to both men and women and is designed to help you to finally break away from worrying by growing closer to the Lord. We will be staying in the beautiful Family Life Center (A one-story facility with 50 air-conditioned rooms with private baths for individuals, couples and family members. Each room has a double bed and a single bed and a private bath. Four rooms are fitted for wheelchair accommodation, and contain one double bed).The cost for the weekend retreat (including meals and lodging) is only $225. Please email me if you have any questions or need additional information. 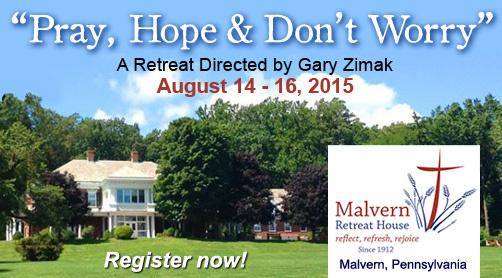 Click on the following image to register for the Pray, Hope and Don’t Worry retreat. Space is VERY limited (100 people), so make it a point to register today! Looking For A Great Way To Start Your Week? I am now part of the Wake Up! team on Catholic Community Radio in Baton Rouge! 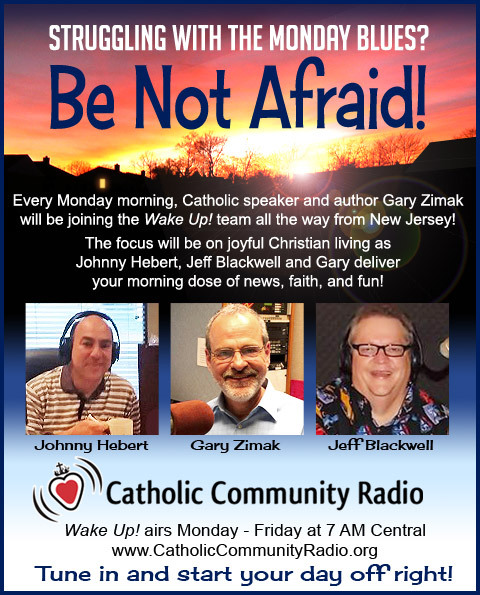 Each Monday, I’ll join Johnny Hebert and Jeff Blackwell all the way from New Jersey as we help to get your day (and your week) started the Catholic way. 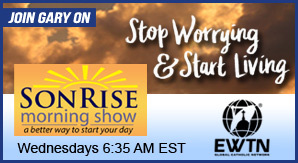 In addition to all of the regular news, faith and fun, I’ll be presenting my “Be Not Afraid” segment at 8:35 AM Eastern. 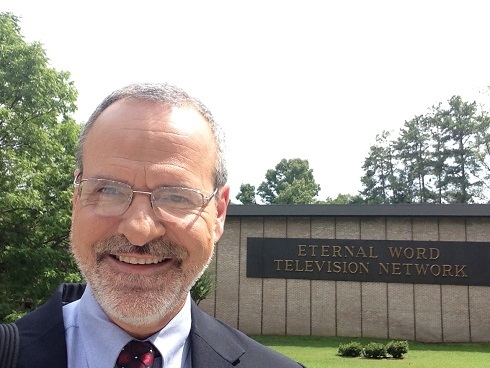 If you’re not in the Louisiana area, you can listen online HERE. Don’t face the new week all by yourself. Grab a bowl of grits and join us Monday at 8 AM Eastern. We’ll help you to start your week off right!